The warrior depicted on Legnano headbadges is none other than Alberto da Giussano, immortalized in the moment of triumph — specifically, the defining triumph of his era — at the Battle of Legnano in 1176, when the “Free Communes” of the Lombardi league, led by Milan, finally defeated and cast out the German rulers who had been lording over them the previous couple centuries. That this remains important to Italians can be evidenced by the mention of Legnano in that country’s national anthem — the only other city mentioned being Rome itself. Why it was important to a bicycle manufacturer, even an Italian one, may be a trickier but no less intriguing question. National pride? Perhaps. The smell of victory attached to the name? More likely, given Legnano’s output includes a long, rich lineage of pure racing bikes as only Italians produce, and an impressive roster of victories on the road race circuits. The turning point comes in 1924, when Fascism was looking for sports heroes and only wanted Italian companies. Bozzi offers a lifetime contract to a young house painter, Alfredo Binda, and changes the company’s trademark to Legnano, a single name. The symbol is Alberto from Giussano, the commander who fought and won over Federico Barbarossa. Before that “turning point,” the company bore the uninspiring name of Emilio Bozzi & Company. While the machines they produced were already aesthetically gorgeous and highly race-worthy, the name they would eventually carry to fame did not arise until Italian pride (and Mussolini’s corporate statism) committed their original name to the history books. 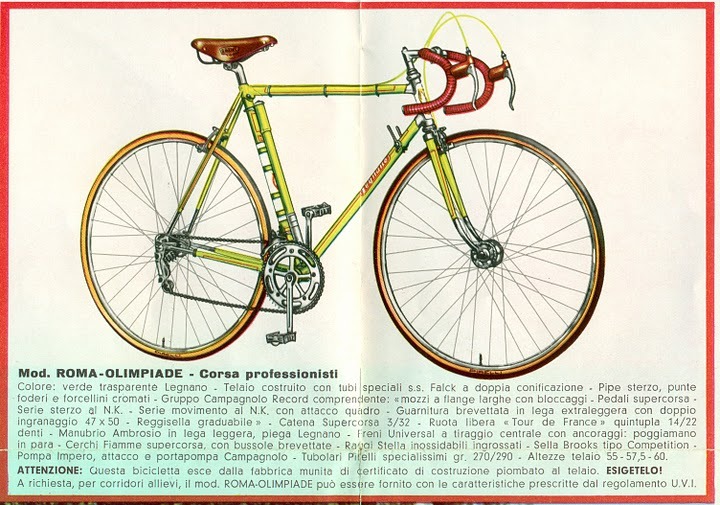 While some claim the bicycle enterprise that became Legnano started as early as 1902, the earliest hard evidence comes in 1908, when Emilio Bozzi founded a company to build bicycles in his own name. Not long afterward he formed an association with Franco Tosi, who had bought some patents from Wolsit of England, a renowned English bicycle company of the time. Tosi was also from Legnano, but the company kept Bozzi’s name until 1924, when they hired Alfredo Binda to ride for their team. Having maintained a sideline busin ess selling motorized bicycles and mopeds for many years, Bozzi and Tosi eventually sold this business to NSU in the 1930s, and finally discontinued mopeds in 1968. Bicycles were always the lifeblood of the company, especially after the duo’s intense involvement in road racing beginning with Binda. During the mid 1930s, Legnano’s team, starring Binda but captained by Eberardo Pavesi, collected six world titles and won five Giro d’Italia, two Tours de France, four Tours of Lombardy and numerous less famous races. To make matters more interesting (and no doubt profitable), the racing world promoted an emerging rivalry between the Legnano and Bianchi teams, the latter being a far older company established in 1885, who must have seen Legnano as something of an upstart. Upstart or not, Legnano was by then a maturing company, and with the world plunging into a war partly initiated by Germany’s refinements of Mussolini’s fascism, Legnano adds a pair of bonafide cycling all-stars to its team: Gino Bartali in 1936, followed by Fausto Coppi in 1939. Binda, Bartali, and Coppi: three legends whose contemporary reputations outshine the warrior prince on the company’s headbadge. Victory after victory followed on road courses and in velodromes, while Bartali and Coppi developed their own rivalry temporarily obscuring that between their employer and Bianchi. All of which gets overshadowed by a war where victory will not belong to their motherland, to the extent war produces victors. Coppi sets the hour record on a Legnano in 1942 at Vigorelli, while bombs fall outside. After the war, dazed and searching, the nation needs distractions, and focuses again on the rivalry between Bartali and Coppi, this time folded back into the renewed context of Legnano versus Bianchi, for Coppi is now riding the older firm’s machines. In 1948 Bartali wins the Tour de France on a Legnano. In 1956, a young rider named Ercole Baldini wins in the Melbourne Summer Olympic Games on a Legnano. That same year Baldini breaks Coppi’s long-standing hour record of 1942, again on a Legnano, but after that racing victories begin petering out. 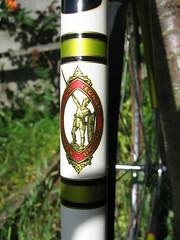 Legnanos of the era sported the perhaps-inevitable Campagnolo Record group. 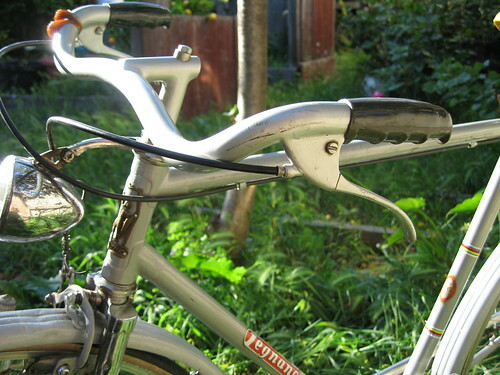 Somewhat more of a surprise, they also featured special Brooks saddles that — according to the inestimable Sheldon Brown — were branded as Campagnolo. Sheldon further suggests top-end models of that time may be worth several thousand dollars today — definitely collectible pricing! Bozzi was assassinated by Italian Red Guard radicals in the 1970s, after which the family lost interest in manufacturing. Arch-rival Bianchi bought the brand in the 1980s, and it saw racing action again under Fondriest, but Bianchi apparently did not truly have their heart set on promoting the former upstart competitor. Nothing wrong with that — the world needs all the everyday bikes it can get, after all — but it’s perhaps too quiet a retirement for a brand forged in battle, and tempered in the storied races of Italy and France. Alberto da Giussano’s ultimate triumph may still be coming. Bozzi and company would have wanted it that way. I had a Viking Hosteller in the ’70’s. I’m sitting here now waiting for my new Paul Hewitt frame to be delivered. Very excited! i am Ibrahim Almalty. 76 years old. Won several races in Libya in the fifties and sixties of the last century. Was rated one of the clubs known to have a bicycle from which made in your factory . So far, I have cycling, which was donated in 1958 specifically to the situation is excellent. If possible, please forward us a copy of 2008 full catalogue and specification on road bike and mountain bike and etc. Any distributor so far in Singapore? Please advice? Your brand was recommended an 80 years old bicycle repairman. I am a proud owner of FIAT automobile Italian products. 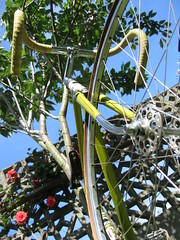 hi…my uncle have an old bicycle…wolsit AC 7448 green..it is new.. thiw the name of Emilio Bozzi..are you interested in it? please let me know soon.. I found this old page from Life magazine, from the ’60s I guess. 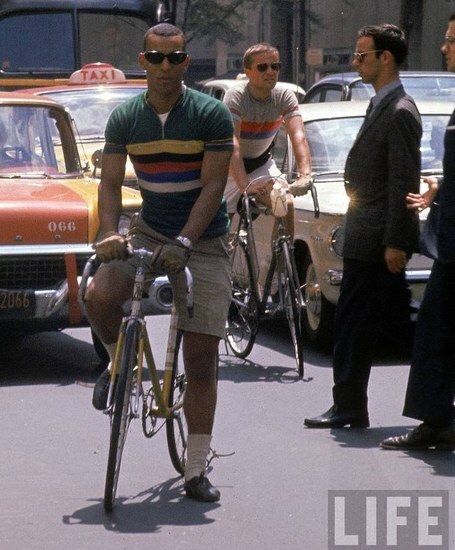 The picture was undoubtly shot in the US, and the man on the left is riding a Legnano track bike. Amazing! 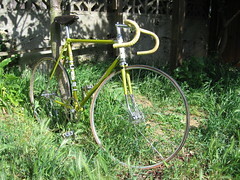 I have a Legnano 10 speed, levers down low,sew on tires,light racing style, green,purchased new in 1970. It is in good shape,not ridden much. Anyone interested or does anyone know what the value might be. I would like to sell it. A local bike shop had no interest in it. Back in the late fifty’s I delivered papers while I was in high school and college. In an appartment house on my paper route was bicycle that always sat on the stair landing. One day I asked the lady who lived up stairs who owned the bicycle. She replied that her son had bought it while he was at the Vatitan. About six months later she said that she could sell it if I wanted it. It was real different than any American bike I had seen, but what the heck it looked new and I made asbout a dollar a day on the papers so I paid her $20. After College I went to pilot training then six years in the Air Force. Then I went to work for Exxon and this bike followed me arround for fourty years. I even came home early one Saturday afternoon to find in the non-sold pile after one of my wife’s garage sales. I kept it in the garage, mainly because thirty years ago I was getting some new tires and the shop owner said it was a vary unique bike a real collector’s bike. Last week I looked on Craigslist under Items Wanted and “looking for old bikes” was listed. Sunday I got a call from some guy who was looking for an old ten speed bike. When I got it out and he started looking at it, mentioning the metal warrior on the front frame and the Campagnolo brakes and changer. He said he had heard about the Chartruse yellow paint job. Well a long story short fron Rome to Lexington, KY to Summerville,SC I sole my Bike. I was glad that a real bike enthasusist got it because I knew it was a great bike even back in the fifty’s. He started mentioning that he could put it back in shape with new stickers and such I knew it had a good home. Steven- Value depends on equipment and condition. Maybe $1-200. Ed- I hope you diid OK. A 1959 Roma with a vary early Campy Record set could sell for $2500 or more. 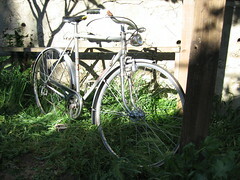 I have a Legnano cycle that is very original and has an unusual frame. It is very well made. I think it was a urban rental bike. I have never seen anything like this before. I was just learning more about the maker. These bikes look good and have good history. I collect old cycles. I don’t know how to send a picture. 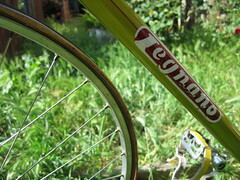 I have a about a 1967 Legnano bike with almost all orginal parts. Has a Campy record. Anyone interested?? Email rabbitfufu2222@hotmail.com and I can send pixs and more info. Wonderful bike!!! hola gente , estoy restaurando una bicicleta legnano de mi abuelo la cual gano muchos campeonatos aca en argentina en el año 1945, tenia llantas de madera , y el numero de cuadro es sb2590. le cuadro es muy lindo y muy liviano , cualquier deto del modelo o año de fabricacion me sirven ya que estoy armando un albun con las carreras de mi abuelo y su bicicleta legnano, desde ya muchas gracias , saludos, desde rosario argentina. Great! love those fixie bikes! I have a 50’s? 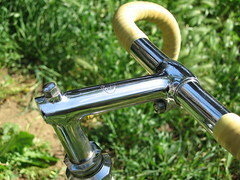 Legnano Track bike. Noah, did you find a home for your track bike? Dear Owners of Legnano, i would appreciate if u can email me the pictures of your bike that you are keen to let go and the price too. I am now riding a legnano too.